Welcome to Lima!! Upon arrival into the Airport you will be met by our representative and transferred to your hotel. Our representative will assist you with check-in procedures and provide you with a detailed itinerary, vouchers covering all the services included in your tour and additional information on the organization of your Peru trip. You will also receive a contact information sheet with all the hotel details as well as our offices contact information for each city and a 24-hour emergency number. At the appropriate time, transfer to the Lima airport to board your flight to the city of Cusco. 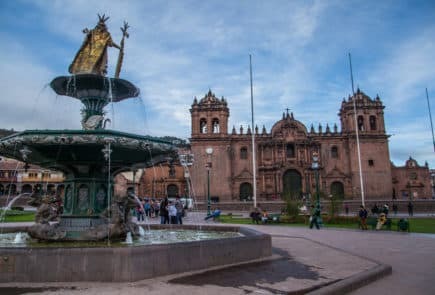 Upon your arrival to Cusco's airport you will be met by our representative who will assist you with your luggage and drive you to the hotel for your check-in. Rest of the day at leisure to relax in your hotel in order to avoid altitude sickness. AM: Walking city tour, including a visit to the district of San Blas, with its winding streets, the whitewashed houses, the blue balconies hung with geranium-filled flowerpots, the uneven line of the tiled rooftops and the endless stairways. In the neighborhood live the folk artists of Cusco, who for centuries have used their hands to tell the tale of their longings and frustrations working in stone and woodcarving, sculpture, doll-making, silverware, weaving and textile arts, gold-leaf, mask-making, and an array of ceramics in utilitarian, architectural, sculptural, monumental, grotesque and many other styles for example Edilberto Merida, renowned sculptor. He looked to religion for his primary inspiration, but he moved away from traditional religious images, by making grotesque images with exaggerated features. It is a form of sculpture that has come to be known as "mud of protest." His style is one of expressionism and has thus been referred to as Expresionismo Indio. Then visit the Pre-Columbian Art Museum, the only museum in Peru dedicated to rebound the arts of ancient Peruvian cultures. The collection of 450 master pieces date from 1250 B.C to.1532 A.D.
PM: At leisure for personal activities (see optional tours below). Enjoy a guided tour of Cusco’s traditional San Pedro market with our chef, and learn about its history and diverse vegetables and fruits. Back at the hotel, the chef will share his culinary secrets in a hands-on cooking class, ending with a three-course dinner. Our bartender will prepare a cocktail with fruit selected during your market visit to savor before dinner. Conditions: Minimum capacity 2 persons. Reserve at least one day in advance. Tour the hotel’s renowned art collection then enjoy a brief talk about the evolution of gastronomy in Peru and a cookery demonstration. Concludes with dinner and live opera or classical music. 19:30 Dinner with live opera or classical music show*. *Opera show on Tuesdays / Thursdays and Saturdays. Live classical music on Mondays and Wednesdays. Move on to the wonderful route to the Urubamba Valley. We will stop for a visit to a local craftsmanship textile wonder: the Awanacancha Andean textile center. Be able to witness dyeing techniques kept for centuries, and experience weaving instruments used for hundreds of years in these famous textiles. Following this you will visit the Pisac archeological complex, formed by a collection of remains of Incan dwellings, temples, and terracing, all of which combine perfectly with the majestic landscape of the Sacred Valley of the Incas. Visit the Pisac markets where you will have the chance to interact with the local people and even haggle with the merchants. Private Garden Lunch will be served Rio Sagrado Restaurant and remain of the day at leisure to rest and enjoy the hotel. Start your day with the Visit of Chinchero Village. An attractive church built during the Colony is the highlight of this village and on the inside hang lovely paintings from the Cusco School. Yet, it is on Sundays that the action really starts to happen when area merchants and farmers assemble at the flea market to buy and sell, using the age old method of bartering for goods. Continue to the salt mines of Maras, an arrangement of terraces, where salt is gathered in small pools, which are filled by hot spring waters containing an astonishing percentage of salt. These springs have been exploited since Inca times. It proves to be an unforgettable experience when you see the sun reflected on the hundreds of white salt pools. Moray is something very different. Four natural depressions in the landscape were used by the Incas to build terraces that served them as a botanical laboratory to improve their harvest. The circular-shaped terraces still remain intact. After enjoying a delightful lunch at a local restaurant in the Sacred Valley, you will visit the Inca fortress of Ollantaytambo. It was constructed in order to guard and protect entrance from unwelcomed visitors, protect from possible invasions of tribes probably coming from the jungle lowlands. After seeing the magnificent past of the spot stroll through the quaint streets of the present town. After the tour drive back to your hotel for an overnight in the Sacred Valley of the Incas. Early transfer to Ollanta train Station to board the Hiram Bingham Orient Express train that will take you to the town of Aguas Calientes. During the journey you will enjoy brunch and marvel at the changing landscape as you travel from Andean highlands to the beginnings of the jungle (“eyebrow of the jungle”), before finally arriving at the town of Aguas Calientes. Brunch on board will be included. Upon arrival you will have a shared guided tour of the Inca Citadel which is provided by Belmond & will be with others that came with you on the Hiram Bingham train. When you finish exploring you will have an afternoon tea at the Machu Picchu Sanctuary Lodge. Departure for Cusco is at 5:50 PM, pre-dinner cocktails will be served in the bar on board train accompanied by live entertainment, and afterwards a 4-course a la carte dinner will be presented in the dining cars. The train will pull into Poroy station in Cusco at 9:16 PM. Upon arrival at the train station you will be met by our representative and private driver for your transfer to the hotel. Private transfers with local English speaking transferman and guides. Private services with local English speaking guides as indicated in the itinerary except Machu Picchu excursion which will be provided in shared basis by Belmond Hiram Binham. 06 nights’ hotel accommodation at Belmond properties.